Hurry! 50% off all Expressionables personalized treats. Offer valid until 6/12 – use code 50CART at checkout. Use code 50CART at checkout. 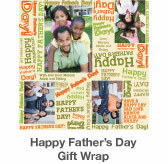 Father’s Day is fast approaching and our personalized Father’s Day gift wrapwill add the perfect finishing touch to your Father’s Day gift. 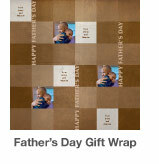 Our special welcome offer has been extended to Sunday, June 12.Order by midnight on Sunday, June 12, 2011 to ensure delivery for Father’s Day. 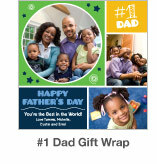 This Father’s Day, let us help you give him a gift that he will never forget.Celebrate this Father’s Day with Expressionables. 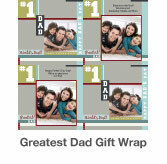 gift wrap, photo gifts and more for all of life’s special moments. when you made a purchase and opted to receive future promotions or signed up for email promotions.